In earlier posts I have used rank-frequency plots to compare the changing use of shot scales. See here for a comparison of the changing use of shot scales in Hollywood and German cinema from the 1910s to the 1930s, here for a comparison of shot scales in Hollywood films from 1959 and 1999, or here for a piece on Alfred Hitchcock. The rank-frequency plot is very useful for comparing how the use of shot scales varies between groups of films by looking at the dominance of the most frequent (2nd most frequent, etc) scale (irrespective of which scale that actually is), but is less useful if we want to compare the variation of shot scales in individual films or between groups of films without ordering the data by rank. To meet this need, we can use the index of qualitative variation (IQV). The IQV is the ratio of the observed variation in a categorical variable to the maximum amount of variation that could exist. If all the observed elements were in a single category, the would be no variation and IQV = 0. If the observed elements are distributed equally across all the categories, then IQV = 1. The greater the value of the index, the greater the heterogeneity of the shot scales. where K is the number of categories and Pi is the proportion of elements in the ith category. 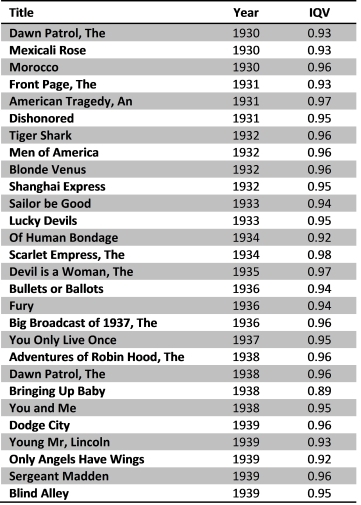 Using the same data for Hollywood films from the 1910s, 1920s, and 1930s that I used in the study linked to above, we can look at the variation in the use of shot scales between individual films and groups of films. First, we calculate the IQV of each film. 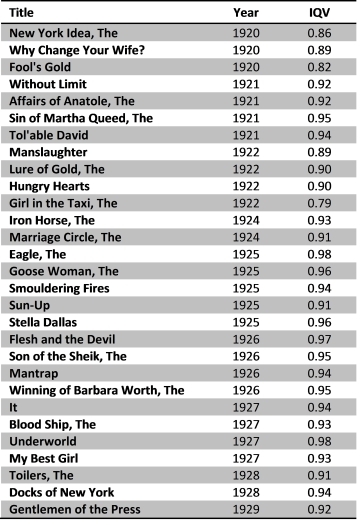 For example, if we want to calculate the IQV for The Front Page (Lewis Milestone, 1931) we calculate the square of the proportion of shots of each scale and sum these together (see Table 1). 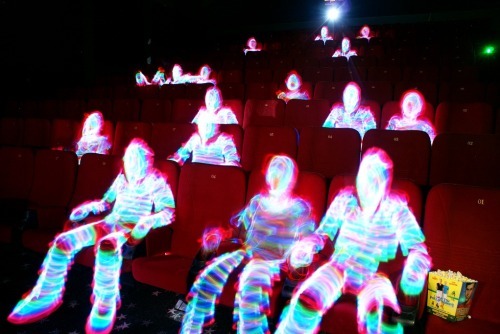 (The data source for this film and others studied here and other information is given in the paper referred to). From Table 1, we can see that the sum of the squared proportions is 0.20. 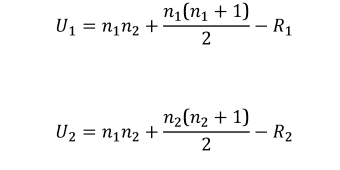 Subtracting this value from 1 gives us the index of diversity: 1 – 0.20 = 0.80. Standardising this value by the factor k/(k-1) gives us the index of qualitative variation. As the shot scales in this film have been sorted into seven shot scales, the standardisation factor is 7/6 = 1.17. The IQV for The Front Page is 1.17 × 0.80 = 0.93, and indicates a high degree of variation. Completing this process for all the Hollywood films I looked we get the results presented in Tables 2 through 4. We can see that the variation in shot scales in The Front Page is consistent with the style of other Hollywood films of the 1930s (Table 4), but is very different from the films of the 1910s (Table 2). 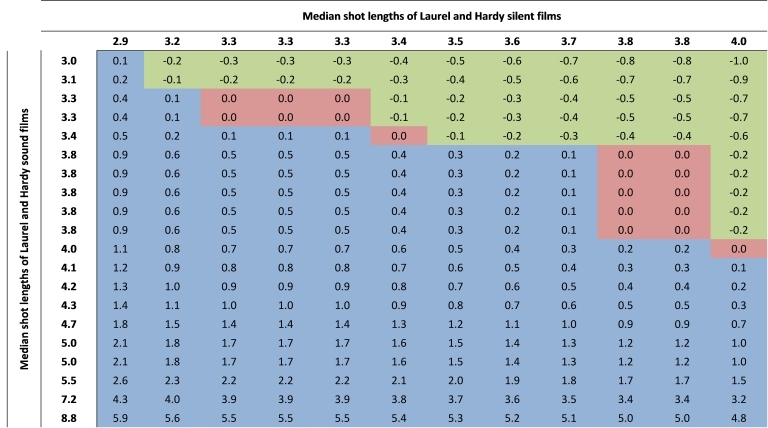 From Table 2, we can see that the variation of shot scales in Traffic in Souls and David Haurm exhibit less heterogeneity than other films of the 1910s. 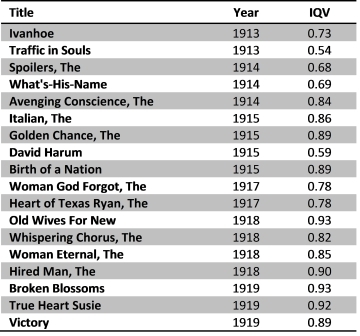 The data in these tables also suggests a trend over time: the IQVs in Table 2 indicates that films from the later 1910s show greater variation than films from the years prior to 1918; and, to a lesser extent, the IQV is lower for films in the early 1920s than in the later 1920s (Table 3). There is no such trend in the 1930s. 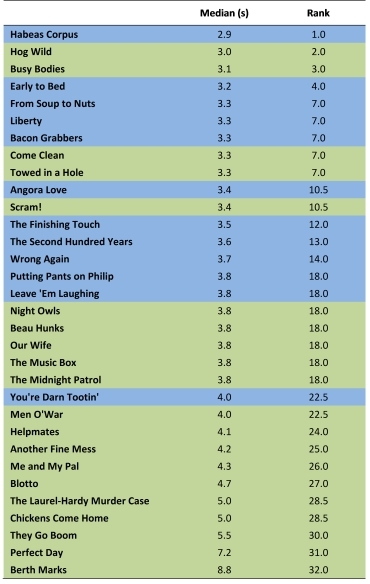 The distribution of the IQV for the films listed in Tables 2 through 4 is presented in Figure 1. 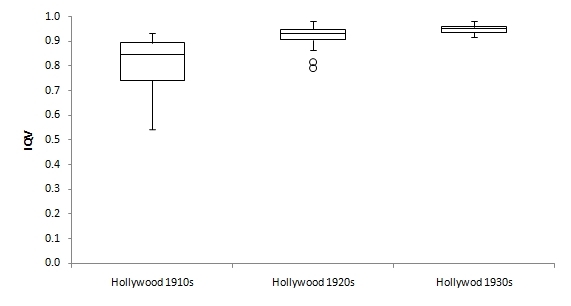 From Figure 1 we can see that the variation of shot scales in Hollywood films shows increasing heterogeneity from the 1910s to the 1930s. We can also see that the distribution the IQV becomes narrower over time, indicating that Hollywood films converge to a single style. This is, of course, exactly what we should expect to find with the emergence of the dominant continuity style of classical Hollywood. The IQV is a simple way of comparing the style of films that can make dealing with a large amount of data much more manageable.